Also subscribe to our Book, DVD, Games and TV mailing lists. Please Note: we will not pass on your email address to any third party. 1. The Call Of The Wild 2. Serve You Right 3. My Antidote 4. Mind Your Manners 5. Lost Inside The Girl 6. Read Between The Lines 7. Slow Grind 8. The One You Loved Is Gone 9. Driving Rain 10. Sugar Cane 11. The Great Pretender 12. Boulevard Of Broken Hearts Slash featuring Myles Kennedy & The Conspirators release 'Lliving The Dream' on Roadrunner Records. 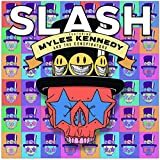 Living the dream is slash's fourth solo album, and third for slash and his bandmates myles kennedy (vocals), brent fitz (drums), todd kerns (bass & vocals) and frank sidoris (guitar & vocals).